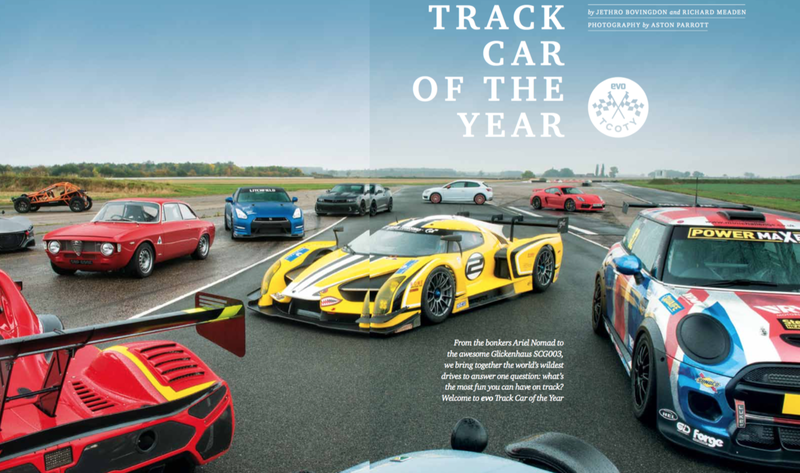 The Scuderia Cameron Glickenhaus SCG003 has starred in the Track Car of the Year feature in the latest edition of renowned UK magazine Evo, which also has several international editions. SCG’s founder Jim Glickenhaus was in attendance at the group test at the Blyton Park circuit in Lincolnshire, where his creation sat at the top end of a diverse spectrum of track-focussed cars being pitched against each other. With such a variety of machinery on test, from the 1960s to the present day, the focus was on the subjective thrill of driving rather than a direct comparison of all the cars present. Rain on the SCG003’s test day meant it had to run on intermediate tyres rather than slicks, but the Evo team were thrilled to have the chance to sample the car, which left a strong impression on journalist and tester Jethro Bovingdon. Describing the SCG003 as “a GT3 with a heavy twist of LMP technology”, he continued: “Bizarrely, it’s an incredibly easy car to drive. It feels low, wide and super-stable, while the ABS brakes, traction control and the car’s natural composure really build confidence. You can push the front end so hard under braking it’s quite amazing. The SCG 003C will compete on the forthcoming Nurburgring 24 Hours at the end of May, and is also scheduled to take part in selected VLN rounds at the German track during the run-up to the race.